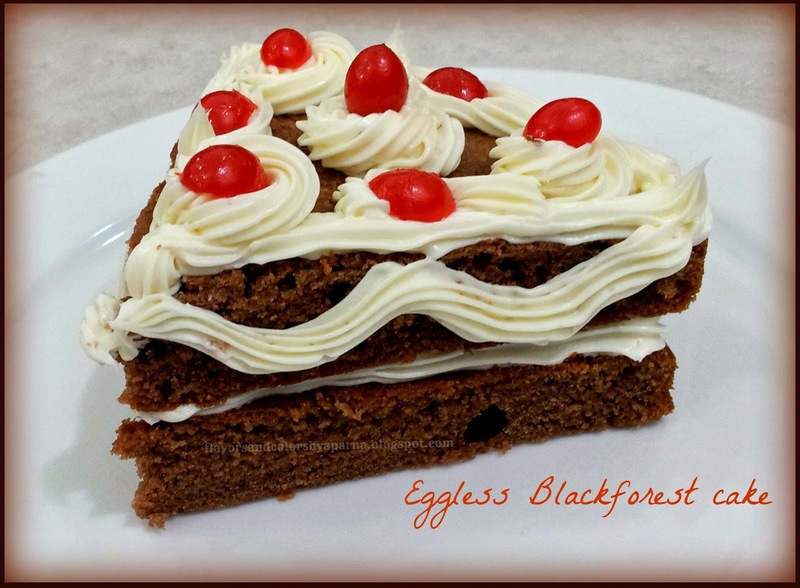 Since the time I developed interest to cook, I was looking forward to baking and preparing a simple eggless cake. Blackforest cake being favourite at home, I browsed through various recipes and came across one at Easycooking by Divya. The recipe and steps were so easy [No wonder the blog title is easycooking] that I instantly bookmarked it and finally I am here posting the cake baked from home. Have been baking it regularly now after my first attempt [cake seen in the last pic on this post] with few adaptations. Rest of the pics are from recent attempt and have been updated on 1/1/2017. Lets move on to the recipe to see how it is made. Sieve maida, cocoa powder,baking powder and baking soda. Keep it aside. Grease the cake tin [mine was 6 inch pan] either with butter or line it with parchment paper. Preheat oven to 150 deg C.
Place butter in a vessel. Add milkmaid and beat well. Add vanilla essence and mix well. Add sieved dry mix to the milkmaid-butter mixture alternating with cola till the dry mix and cola are finished. Pour the cake mixture in the baking tin [The batter should always fill half to two thirds full in the baking tin and there should be sufficient place for the cake to rise up evenly]. Bake it until the cake is done. Insert a knife/ toothpick in the center of the cake to check if it's done or not. Remove the pan from the oven after 5 mins and let the cake cool on a wire rack. As the cake is resting on the wire rack you can prepare the sugar syrup. Mix water, sugar and pitted cherries in a sacuepan and heat it on low flame. Boil till the sugar dissolves completely. Keep it on low flame for 2-3 mins and then switch it off. Strain and keep it aside to cool down. 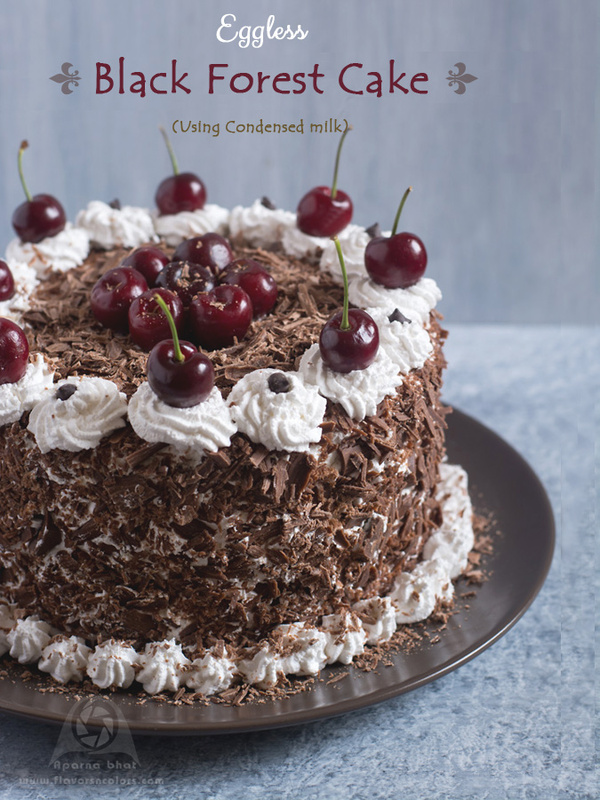 Keep the strained pitted cherries aside which you will use while assembling the cake. Meanwhile mix whipping cream with vanilla essence and beat it. Add icing sugar gradually and beat it well until the mixture thickens and forms soft peaks. Once the cake is completely cooled, cut the cake into 2-4 layers horizontally based on the height of the cake. Separate the layers by placing them on plate and sprinkle the cherry sugar syrup on each layer. Spread the whipped cream on each layer and then place strained cherries on top. Spread another layer of whipped cream on these cherries. Repeat these steps with other layers. Place each layer of cake on the other. Spread the whipped cream on top of the cake. Level the cream on top and sides of the cake with a palette knife or a spatula. Whip the rest of the cream to form stiff peaks. Place the cream in piping bag with rosette nozzle/any other icing nozzle and pipe out rosettes on the edge of the cake. Place fresh cherry, one on each rosette or on alternate rosette. Decorate the cake as per your liking and patience. Here I have sprinkled chocolate shavings on top of the cake and placed some on the sides of the cake. Place the cake on serving tray/plate and pipe borders on the tray. My family enjoyed eating this cake as much as I enjoyed preparing. beautiful :) im gonna prepare this today :) have a doubt thou... when u say oven do u mean the OTG or microwave oven ???? @Neetha: Thnks ... this cake is done in oven that has come with cooking range... You can browse on blog for a cake recipe made in microwave too. Nice post. 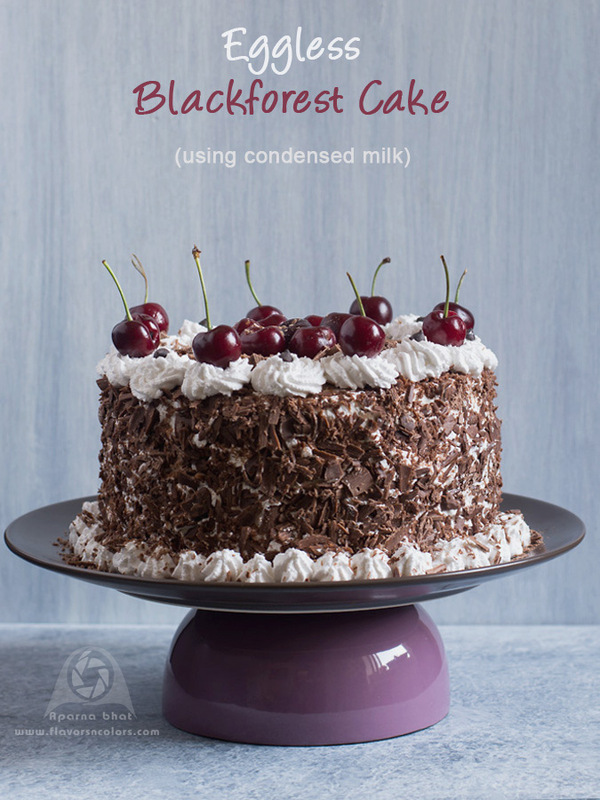 Black forest Cake is my favorite cake. I am going to try this recipe soon. 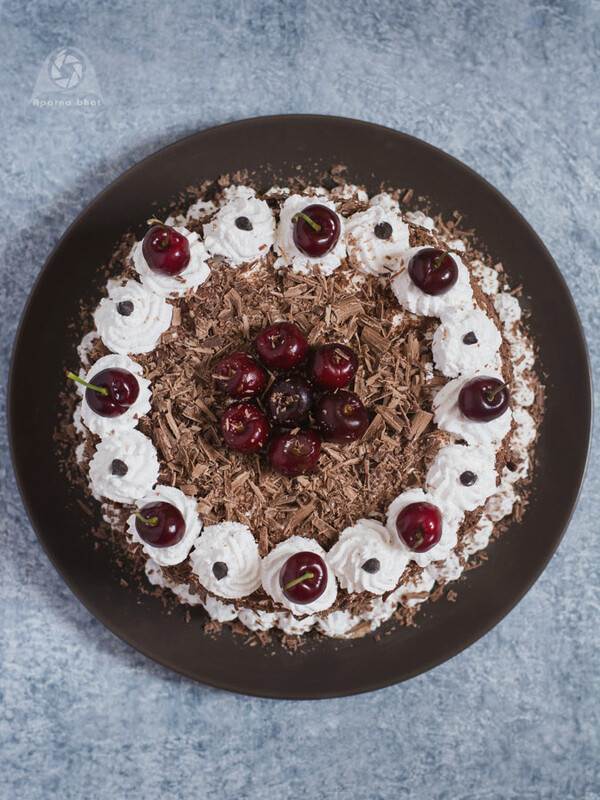 The decoration of cherries looks awesome.